Provide operating funds for TANK pilot service that leverage private contributions and connect industrial parks and major employers with high volume TANK fixed routes and Park & Ride lots. Step 1: TANK, in cooperation with Boone County and other partners, conduct a planning process that brings businesses to the table to share information on shift times, set a plan and market to employees. Step 2: TANK pilots and test routes to see if a critical mass of employee riders (15-20 per hour of service) can be reached. Step 3: When critical mass is reached, TANK would consider adding the route to the TANK fixed-route network and the Pilot Service Program could move on to other Boone business locations to repeat the process. Builds upon an existing and proven TANK pilot program. Provides a highly efficient and flexible transit service using appropriately-sized vehicles that operate where and when they are needed, thereby maximizing public and private transportation investments. Reduces door-to-door travel times and cost for Boone County employees. Enhances Quality of Life for Boone County employees. Increases Boone County employers’ ability to attract and retain employees by widening the regional pool of potential workforce candidates through increased accessibility across the region’s public transit service areas. Helps to reduce overall Boone County roadway congestion through increased transit usage. Securing a steady funding stream for transit operating costs. Working with private employers to market and incentivize use of the pilot service program to their employees to secure critical mass. Existing and future data does not support this as a safety-related transportation improvement. Hebron, CVG, KY 536 (Mt Zion Road) and KY 338 (Richwood Road) are the areas most impacted by this growth in employment. These areas are home to major companies that serve as significant traffic generators employing hundreds of people who reside across the entire OKI region. TANK currently operates six Park & Ride lots in Boone County with a total of 461 spaces. 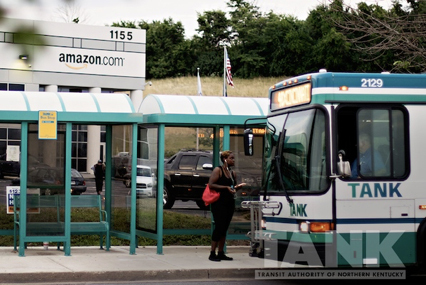 TANK currently operates one Transit Hub in Boone County (Florence Transit Hub (831 Heights Boulevard) with 170 spaces.